Benedict Cumberbatch Talks Doctor Strange, Comics & Cool Costume | Dr. In this Doctor Strange interview, cool actor Benedict Cumberbatch, whom you’ve seen and heard as villain Khan in Star Trek Into Darkness, as the voices of dragon Smaug and then angry tiger Shere Khan in The Jungle Book or as Sherlock Holmes on T.V. 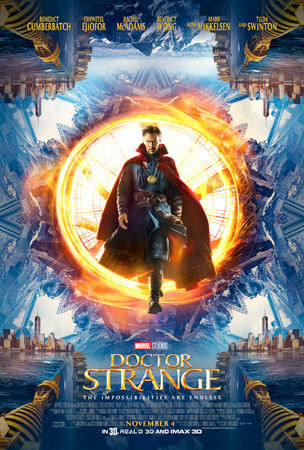 and much more, plays the magical Stephen Strange, a former neurosurgeon who serves as the superhero Sorcerer Supreme, the primary protector of Earth against magical and mystical threats in the Marvel Comic Universe. Check out the fun and informative interview as the cast talk magical hand movements, cool costumes, visiting comic book stores, hanging out with doctors and why the movie is especially relevant to all of us right now! Q: Benedict, we hear that the filmmakers changed the movie’s schedule so you could play the role. True? Benedict: I’m very glad they did. It's incredibly flattering. It's a weight of responsibility as well, but it's a great motivator to try and do a good job and fulfill the promise they've given to you. Q: What about the character makes him interesting for you? 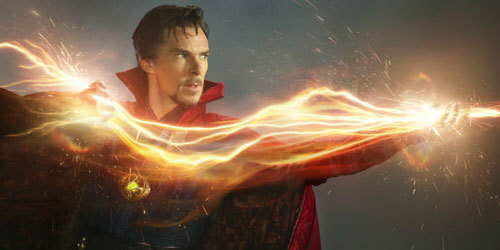 Benedict: This film had lots alluring qualities, lots of things that made me really want to go for it, and this character in particular, and in particular what Scott and Kevin were pitching to me as his trajectory, his origins story, where he was going to lie within the Marvel Cinematic Universe. The journey he goes on was supremely important to me, and the qualities of drama, but also great humor amongst that profundity and that oddness and unique weirdness and newness that we were going to bring visually, so I kind of put the purer thing on the back burner. Q: The special effects and costumes in the film are really amazing. 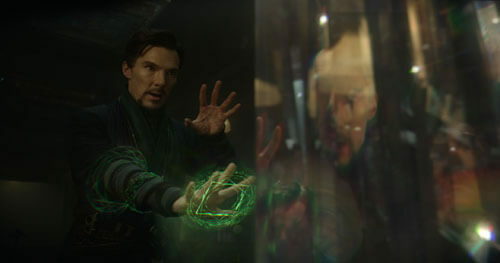 Benedict, when you got all decked out in the cloak and looked in the mirror for the first time and saw yourself as Dr. Strange, were you like, "Wow, this is cool." Benedict: Yeah, I was sort of giddy like a child at Halloween! It was the first moment (I’d had it all on) and Alex (Aponte), our brilliant costume designer went, "Oh you’re having the superhero moment, aren’t you?” It really was the penny drop moment for me. I really was quite giddy. I just kept giggling. The second time it really hit home was near the end of the main body of the shoot, when we were in New York. We were on 5th Avenue and there were as many paparazzi as there were crew. We were running down the street and skipping and jumping to fly. And there was the Empire State Building in the same eye line, and it was just a moment of magic to think that the men and women that first crafted these comics were in that building and other buildings in town. Tilda: Didn't you go into a Forbidden Planet or a comic book store? Benedict: I went into a comic book store, which was the last day shooting in New York. 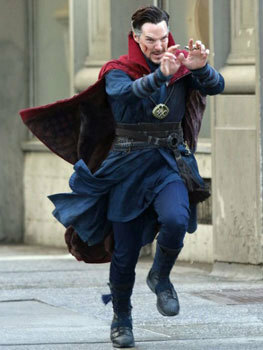 Yeah, Scott was like…(Note: the film’s director Scott Derrickson explains, “I have the video on my phone. I've never showed it to anybody but Benedict. It was a spontaneous thing. He said, "There's a comic book store right there.” He was in full (costume). And he said, “We have to go in." He goes, "We should shoot in there. Film it. It will just be us." We were getting ready to shoot. I put the camera on him and he introduced himself. He said, "Hey, I'm about to go into this comic book store." I followed him in and the people who were there couldn't believe that it was Dr. Strange. He bought off a bunch of Dr. 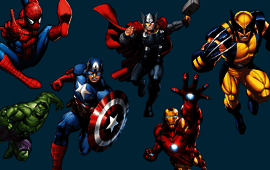 Strange comics”. Benedict: But I didn't have any money so I didn't buy the comics. I offered my services. I said, “If the film doesn't work out I'll come and stock shelves for you”. It was a magic, magic moment. No pun intended. It was very special and utterly like a lot of things in this film, very sort of not searched for. They came about for the right reasons. 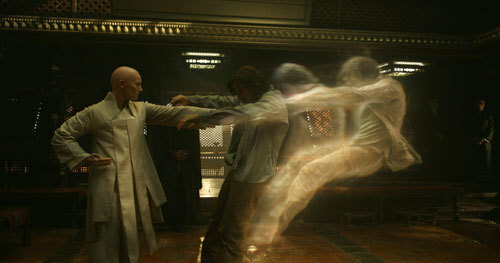 Q: Something very elegant about the film was the magic hand choreography in conjunction with the visual effects. Benedict and Tilda, can you talk about that hand choreography and the precision that was needed to meld with the effects? Tilda: That hand choreography is a thing called tutting. We had a proper master working with us for weeks, I would say. Just as much as learning martial arts, we were learning how to tutt, with JayFunk. He really knows how to do it. He's got properly magic fingers. He taught us a series of extraordinary movements which have to be super precise, because if you're going to go like that, you have to be at a certain point where the line is going to be drawn between your fingers and you can't (have hands in front of your face, which was my issue. Then you have to be exactly the right width so you're in the frame and it was super precise and kind of hairy, but really good fun. Benedict: I had to practice in front of a mirror but she was brilliant. She’s being very humble about it. She was incredibly good at it. Because she was instructing Strange at the same time. There was some quite heavy dialogue going on while she was drawing mandala and punching energy and doing delicate stuff. Q: Rachel, I know everyone got to do some fun stuff. Did you want to say, "Hey, let me just do it for a second. Let me just do the whole hand thing." Rachel: I mean, sure. Hearing Tilda talking about it now, I’m like “I could dig that”. But my mom's a nurse, and I did not inherit that gene, which is why I'm here (an actress) right now. But I was always fascinated by what she did, because it was so far from anything I ever understood. To get to delve into the medical side of things and shadow this incredible female neurosurgeon in Toronto (was incredible). We also had a great neurosurgeon on set and I was offered the opportunity to go on an EVAC helicopter over a weekend but I'm a terrible flyer and I am really queasy about blood, so I declined that. Everything else was super fascinating and in a pinch I could probably suture someone up now, and I think it was so nice to wear scrubs all the time. When he was putting that cloak on and sweating buckets, I was doing my nails. (She laughs.) So I learned a lot on this in a different way. 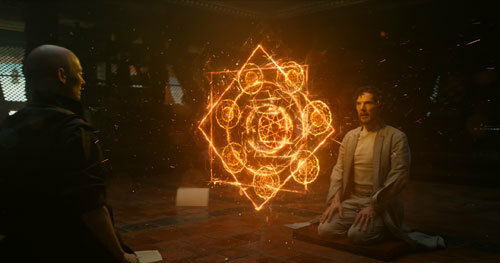 Q: The key to Doctor Strange, at the beginning, is his arrogance, his confidence, his feeling that he’s the smartest guy in the room and then the fall and the humbling that he goes through. Benedict, Is that like playing Sherlock Holmes (his TV character) or is that completely different? 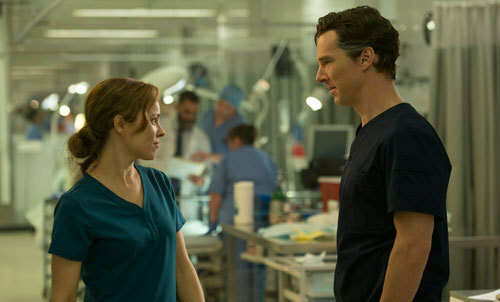 Benedict: I would say that’s still going on in that particular TV franchise. But I’d say it’s slightly different. In the Venn diagram of similarities ( a system that helps to identify what is similar between two things) there is the crossover of clever and arrogant, I suppose, and workaholic. But Strange is a materialist. He’s egocentric, yes. But he’s got charm and he’s witty. He’s liked by his colleagues; he’s had relationships with them. He’s not this cut-off, outsider, sociopathic, asexual obsessive that Sherlock Holmes is. So there’s a world of difference. And he lives in New York and eats bagels every night. That’s also different. He’s a man of the world which Sherlock isn’t. Q: Rachel, when you signed on to play Christine Palmer, did you do binge reading of comics to get up to speed with all this? Rachel: I did read it. Scott sent a few my way that I looked at. She's sort of an amalgamation of a bunch of different characters, so there wasn't one particular place to go to, which I was kind of excited about, because she could be kind of a new invention, in a way. I looked at a lot of “Night Crawler” because she's in a lot of those. I was reading Judy Blume when I was a teenager so I had been kind of getting up to speed on the comic universe, but I love graphic novels. I just devour those now. I love the medium and I think it translates to film. It's just such a perfect match up. So yeah, I'm still learning. Q: Dr. 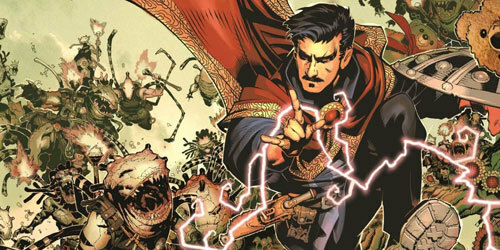 Strange wants to get to Tilda’s character’s level of expertise in magic. Is there one person for you that you're always striving to get to their level of expertise? Benedict: Wow, I wish there was just one, that would simplify my answer but the (cast on this job) was extraordinary. Everyone on it was helping me raise my game, in every level. They're the people with who I get to work with every day on a job like this and headed by a director, a mastermind who both know their craft inside out and whom you feel safe in the hands of. This can go on for a long time. I’m very lucky. I’ve worked with some very inspiring people who are here now with me. Q: This film has a lot to say about opening our minds and our imaginations. Benedict and Tilda, what do you have to say about that? 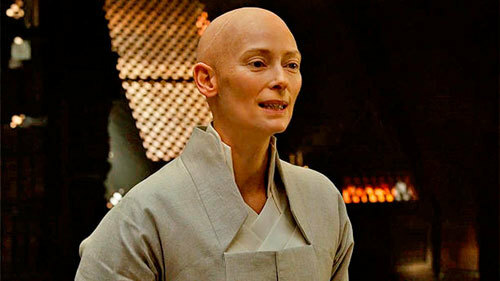 Tilda: Maybe more than ever we need to concentrate on opening our minds. There's something really radical that's said in this film, which is that ego and fear are things to be lived beyond. Let's face it, this is a hot topic. We really, really need people to remind us right now that ego and fear are not necessarily the only option we can live through. This is such a modern film for that reason. I would say that's the reason why it's perfect that it's made now because the time is really right for it. Benedict: I would completely and utterly agree with that. It's about mindfulness in a sense. That’s the common derivative, which has carried through. This is a film for now. Like Tilda was saying, the strongest message is the idea that you, with your mind have the power to change your reality. That's a great, wonderful, freeing egoless message and also if you can do that with the idea of doing it for others, you're onto a very, very good thing, as Doctor Strange gets to by the end of the film. Benedict: I’m so excited about it. I haven’t seen the film yet. If I don’t have too many of these (lattes), I’ll get a proper nap. Then I’ll be glued to my seat. I can’t wait (to see it). I want to share this moment. You can see Dr. Strange in theaters November 4th! Do you think magic is cool? Have you read a Dr. Strange comic? Talk all things “Strange” below.